A thermal dispersion flow switch is a solidstate flow switch with no moving parts. It can be used for monitoring flow/no-flow conditions of a very wide range of liquids. The thermal dispersion flow switch can be provided with solidstate or relay output. They are relatively compact and can be applied in a range of pipe sizes. All stainless steel construction, a variety of process connection sizes are provided. The Thermal dispersion flow switch is available for general purpose and explosionproof environments. The thermal dispersion flow switch is based on the principle of heat transfer. 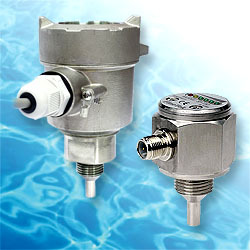 The thermal dispersion flow switch consists of two temperature sensors. One temperature sensor is the reference and measures the temperature of the fluid where the thermal dispersion flow switch probe is immersed. The second temperature sensor is heated using constant power. This creates a temperature difference between the two temperature sensors. As the flow rate of the fluid increases there is a cooling effect due to the fluid moving past the heated sensor. The more flow, the more the cooling. A reduction in temperature difference between the two temperature sensors indicates that the flow rate exceeds a user adjustable set point. When the flow rate drops there is less cooling, which causes an increase in the temperature difference. The thermal dispersion flow switch is usually available in several versions with choices of lengths, materials of construction and output types to meet a wide range of application requirements. One specific application for the thermal dispersion flow switch is featured in the picture of this blog post. This is a diesel engine for marine use with an SP series thermal dispersion flow switch installed within the seawater cooling inlet. 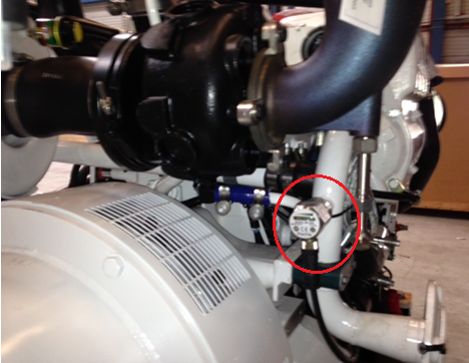 The flow switch ensures a positive flow of cooling water to allow the engine to operate. For a further look at the SP series thermal dispersion flow switch product line you can download the or visit our SP series thermal dispersion flow switch product page. For more information on the SP series of thermal dispersion flow switch you can contact us at .